How much would it cost to revamp your signage? You’ve seen the blue and white stick figure in the wheelchair everywhere – in parking lots, on buildings, in windows. The graphic image is one of the most recognizable symbols in the world. But you may start seeing a new image pop up around Phoenix. The city recently granted permission for businesses to replace the International Symbol of Access, which was created in 1969, with a new icon. The new image shows a more active figure. It’s still blue and white. But it emphasizes ability rather than disability, officials said. Advocates for the change cheered the move. Greene led Cigna’s efforts in Phoenix to approve the change. Cigna, a global health insurance service company, has promoted the change across the country. Sara Hendren, a professor of design at Olin College of Engineering in Massachusetts, designed the new icon and helped found the Accessible Icon Project, a group dedicated to providing people with supplies and services they need to make the switch. Hendren’s inspiration for the new design? The signs you see at national parks. The idea started in Boston with street art aimed at raising questions about disability rights and advocacy, and the images transformed into a social campaign. Phoenix officials approved the change on Jan. 21. Cigna initiated the change by requesting permission to update the signage in its North Phoenix office parking lots with the new icon. The Development Services Department completed the approval process in less than two weeks. 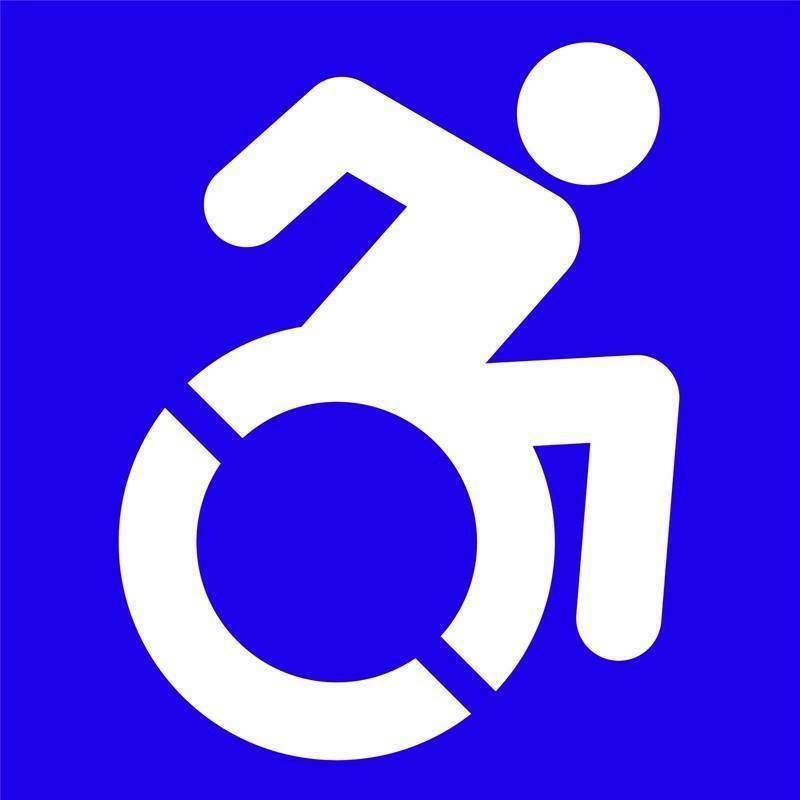 The federal government recognizes the new icon as compliant with the American’s with Disabilities Act. Some states, cities and institutions have adopted the symbol. Cigna plans to replace the old signs at its Phoenix office on Feb. 5. Cigna began replacements at several of its U.S. offices in 2014, including locations in Plano, Texas, and Chattanooga, Tennessee, as well as its company headquarters in Bloomfield, Connecticut. “We’re on the cutting edge of this, so we feel very excited about the fact that we can be among the first in Phoenix to display this,” Greene said. Hendren said she was excited to see the global reach of the social campaign. “We have about a 5,000-person network on Facebook of people who are doing advocacy work literally all over the world,” Hendren said. Although Phoenix officials support the use of the new icon, the city isn’t pushing businesses to use it. Fischer added that the city itself would not retrofit its signs because of the cost, but it could begin using the revamped design in new or replaced signage. Move the slider to reveal the new logo. Graphic: TreNesha Striggles. 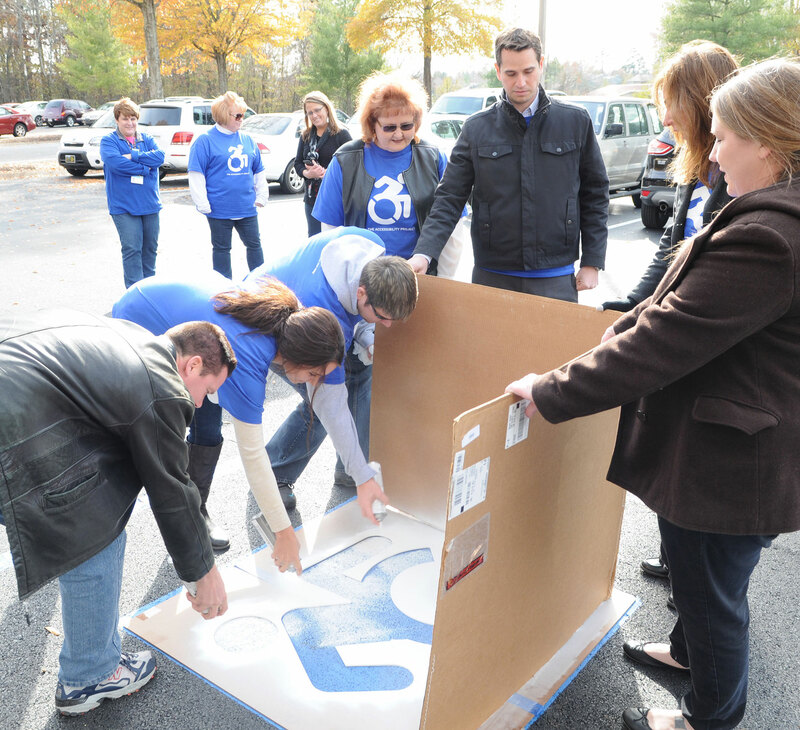 Cigna workers in Chattanooga, Tennessee, replace the old International Symbol of Access with the new one.